This is a great dinner party option. Place the port, sugar and 150g/5½oz of cranberries into a pan and cook over a low heat for approximately five minutes until the cranberries start to burst and the sugar has dissolved. Allow to cool. Place the walnuts into a food processor and blitz until they resemble breadcrumbs. In the meantime, mix together the mascarpone and cranberries in a glass bowl. Slice the brie in half through the centre, creating two rounds or flat wedges. 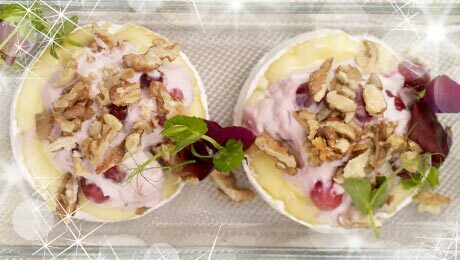 Place the two brie halves on a tray and spread half the Mascarpone and cranberry mixture on top of each. Drizzle with the cranberry and port sauce and scatter over the walnut crumb. Place in a preheated oven for 5–8 minutes until the cheese has softened then serve immediately with some salad greens.